Artist's illustration of NASA's New Horizons Pluto probe beaming data home to Earth. New Horizons finished sending all of the data collected during its July 2015 Pluto flyby to mission control on Oct. 25, 2016. NASA's New Horizons spacecraft has finally finished beaming home all of the data it gathered during its historic July 2015 flyby of Pluto. The last piece of flyby data reached mission control at the Johns Hopkins Applied Physics Laboratory (APL) in Laurel, Maryland, early Tuesday morning (Oct. 25), NASA officials said. New Horizons is currently 3.4 billion miles (5.5 billion kilometers) from Earth, so it takes signals moving at the speed of light more than 5 hours to journey between the probe and its handlers. "There's a great deal of work ahead for us to understand the 400-plus scientific observations that have all been sent to Earth," Stern added. "And that's exactly what we're going to do. 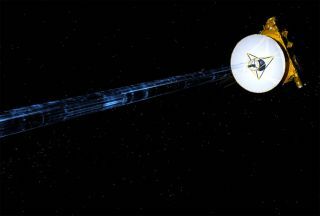 After all, who knows when the next data from a spacecraft visiting Pluto will be sent?" The $700 million New Horizons mission launched in January 2006, tasked with getting the first-ever up-close look at Pluto. The spacecraft performed its epic flyby on July 14, 2015, coming within just 7,800 miles (12,550 km) of the dwarf planet's frigid surface. New Horizons gathered more than 50 gigabits of data during the close encounter — about 100 times more than it was capable of beaming home immediately, NASA officials said. So the New Horizons team commanded the probe to send along a few high-priority data sets just after the flyby; the rest of the information has come trickling in over the past 15 months. And now that work is done. "We have our pot of gold," mission operations manager Alice Bowman, of APL, said in the same statement. New Horizons is currently on its way toward a small object called 2014 MU69, which lies about 1 billion miles (1.6 billion km) beyond Pluto. On Jan. 1, 2019, the spacecraft will perform a close flyby of 2014 MU69, as part of an extended mission that NASA approved this summer. The New Horizons team will make sure all of the Pluto flyby data is in good shape, and then clear the spacecraft's onboard memory to make room for the observations New Horizons will make during its extended mission, Bowman said.